Finland aims to be a pioneer in the circular economy. In the future, the competitiveness of our economy and our well-being will no longer be based on overconsumption of natural resources. The world’s first national road map to a circular economy defines the steps required for a systemic change in the economy. Objective: To create a shared mindset in Finnish society to promote the circular economy and determine the most effective means to do it. Work: Between March and September 2016 Sitra made a synthesis of the views central actors in society had on the needs for change and the required measures. Results: The world’s first national road map to a circular economy includes the first extensive schemes – six key projects and dozens of pilots – which will begin Finland’s transition towards a circular economy. Finland aims to be a pioneer in the circular economy. For example, the Finnish Government aims to make our country a forerunner in the bioeconomy and circular economy by 2025. Finland has a real opportunity to create sustainable well-being and a successful carbon-neutral circular economy over the next 5-10 years. The world needs pioneering solutions to ensure that economic growth and increased well-being are no longer based on a wasteful use of natural resources. Neutral encounters, dialogue and co-operation between different sectors and parties in society – businesses, politicians, scientists and organisations – are required in the creation of circular economy solutions. This is the need we aimed to meet with the process of drawing up the road map. The objective was to create a shared mindset for promoting the circular economy among all of the above-mentioned parties and determine the most effective means to bring about a systemic change in the economy. How did this work proceed? The first ideas regarding the need for a road map to a circular economy were recorded here at Sitra already at the end of 2014, as we were preparing our focus area for the circular economy. At the time, it was seen that society requires a broad, shared understanding that the circular economy must be perceived holistically as a new, cross-cutting economic paradigm in all sectors. “We also faced criticism for how the circular economy would be defined – for whether we would be talking about an economic system. However, we did not want to stray into a discussion which would compare the circular economy with capitalism and communism,” laughs Senior Lead Matti Aistrich, who was preparing the focus area at Sitra at the time. The actual planning of the process to draw up the road map began at Sitra in autumn 2015, when the work in the focus area was properly under way. The encounters of the different parties in society and the shared work process culminated in three round table discussions, in which the current state of the circular economy in Finland was assessed, a vision drawn up for the road map, the means for achieving a shared mindset determined and finally, the measures prioritised and responsibilities allocated for each measure. Before the round table discussions, all participants were interviewed separately. The interviews explored the role of the participants and their organisations and views on how the transition to a circular economy could be implemented in Finland. What did participants regard as Finland’s weaknesses and strengths in terms of the circular economy, and what should Finland focus on in the work? “The interview was good, it made you focus your thoughts on the circular economy,” says Ministerial Adviser Marja-Liisa Tapio-Biström from the Ministry of Agriculture and Forestry. The participants brought up their ideas for pilots in the round table discussions and later, other Finnish people were also able to send in their ideas. Criticism was also received afterwards regarding the identification of pilot ideas and related opportunities for co-operation. “More time should have been allowed for it so that we would have managed to make the necessary decisions in our organisation,” says Lea Rankinen, Senior Vice President of Sustainability and Corporate Responsibility at SOK Corporation, the corporation of Finnish co-operatives. 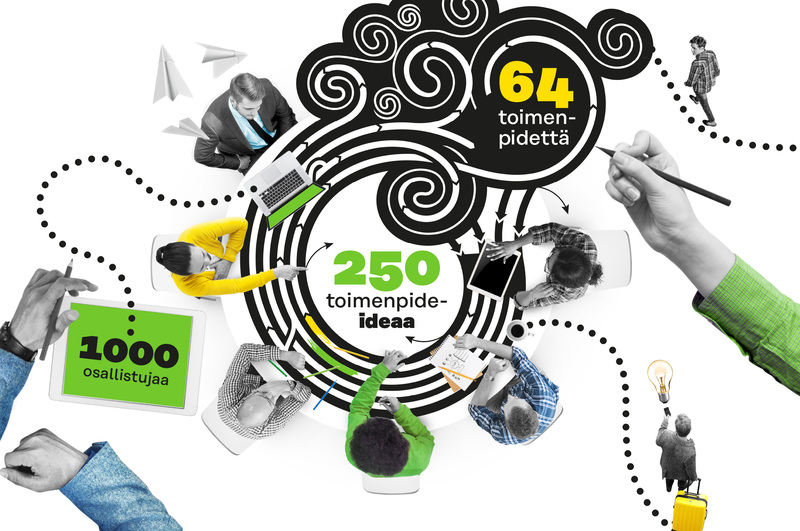 In spring 2016, almost 50 different parties (link in Finnish only) from the public, private and third sectors (for instance NGOs) were invited to draw up the road map. Sitra invited tenders from consultants to find help for following the process through. Deloitte, which was chosen to do the work, contributed a way of thinking from the world of business to the process, which it had gained in different types of strategy work. Sitra’s role as an independent party, not funded by the central government or businesses, was extremely significant as it allowed the participants in the process to feel that the starting points were impartial and fair. The circular economy often forms at the boundaries of sectors or when different sectors meet. Tapio-Biström from the Ministry of Agriculture and Forestry is satisfied with the large range of participants that worked on the road map. New perspectives were gained for many projects that were under preparation in the ministry. “The road map process really expanded the scope of preparation in our ministry, which was far too focused on administration,” she says. According to Järvinen from Sitra, the intention in the original plan was to have participants carry out small-scale, concrete trials during the process. Ideas and new operating practices would have been tested in them with a light organisation and fast timetable. Although the intention was to use the trials to engage the participants, the idea was given up because there was not enough time available. “We invited all Finns to bring their best pilot ideas and practices to the table,” Järvinen continues. In the end, hundreds of Finns commented on the draft road map and made proposals for pilots. All in all, more than a hundred people participated in the road map process. Sitra used the accumulated material and introduced five focus areas and six key projects in the final road map report it produced at the end of summer 2016. Of all ideas that were gathered, the pilots combining already existing expertise and new innovations into schemes that promoted the circular economy were selected for the road map. It was also considered important that the measure concerned could be expanded at both the national and international levels. The focus areas are those specific topics that will initially be used in advancing the circular economy in Finland. Based on Finland’s traditional strengths, these topics include a sustainable food system, forest-based loops, technical loops, transport and logistics, and joint actions. Regional co-operation (link in Finnish only) provides sustainable locally produced food in the daily life of Finns with the help of kitchens in public institutions. A demo plant (link in Finnish only) for new techniques in the processing of electric and electronic devices helps to test thorough re-use of valuable and rare materials. The Helsinki Metropolitan Smart&Clean project creates export concepts based on smart low-carbon transport that exploits open data. In forestry, the development of bioproducts to replace fossil materials is accelerated with extensive industrial-scale projects. An extensive co-operation model for the ecosystem of Arctic industry is being trialled elsewhere in Northern Finland to enhance industrial symbioses. Finland will take the role of the circular economy host country by organising the World Circular Economy Forum that will introduce the best circular economy solutions in June 2017. Both the public and the private sectors have found the road map a useful way to outline the measures required for Finland to become a pioneer in the circular economy and it has indeed generated new processes. A couple of examples already exist: during autumn 2016 Finland’s first regional road map was drawn up in Southwestern Finland and in the private sector S Group has begun to draw up its own road map to a circular economy. The world’s first road map to a circular economy, “Leading the cycle” outlines Finland’s steps to sustainable success.